Image above: Roger Savage painting in the deep valley around the ruins of structures associated with old East Light. 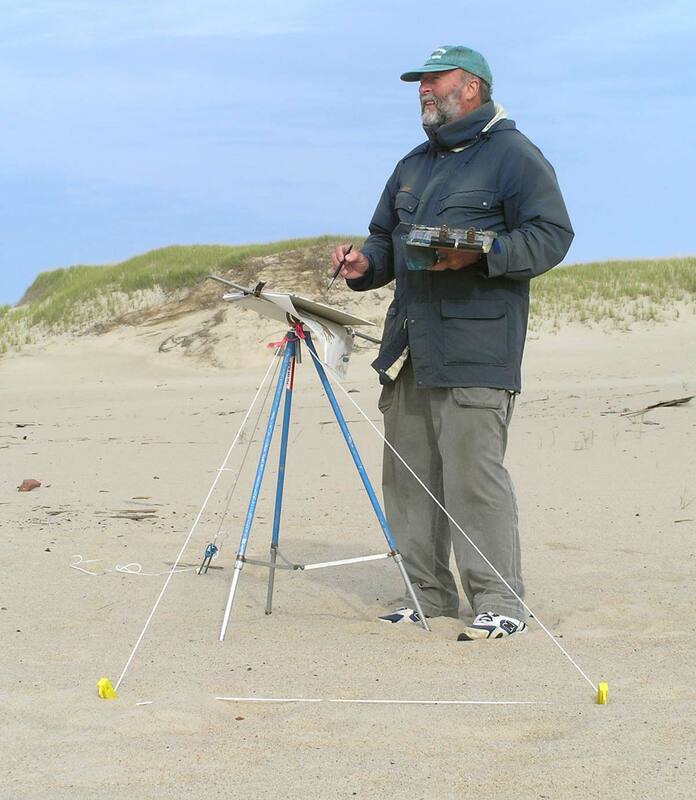 On September 23rd, 2005, Roger Savage arrived on Sable Island to spend ten days painting at various locations—some breezy and sunny, some windswept and overcast, often with sand blowing about. Roger Savage is an artist of the outdoors—inspired by light. He is intrigued by how light changes colours and shapes landscapes, and works outdoors—en plein air—to capture the spontaneity of Nature’s light and shadow. As fog rolls in or clouds blow over the landscape, patterns of light alter and shift. 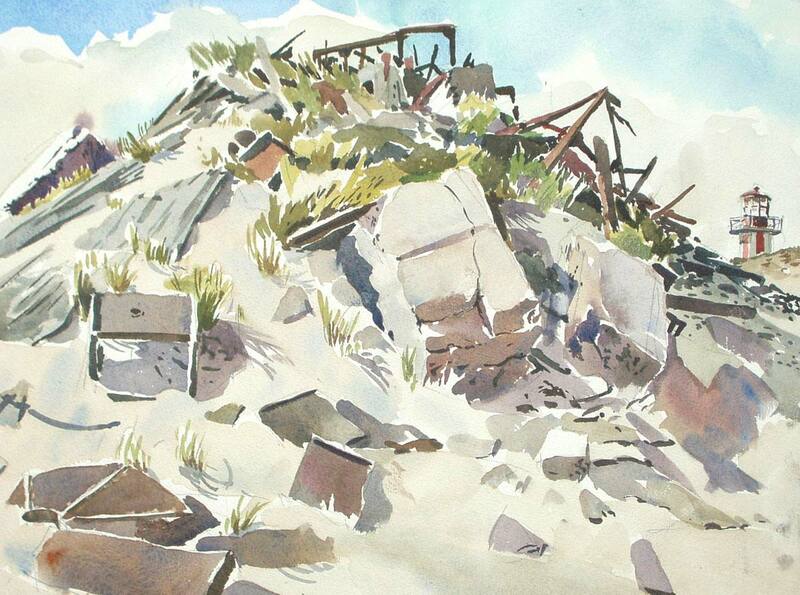 To work outdoors, where weather conditions can change rapidly, Roger uses watercolour on paper—media that enable fast work and response to changing light quality and intensity. Water-based tubed pigments permit a very loose and fluid approach with intense colours instantly. 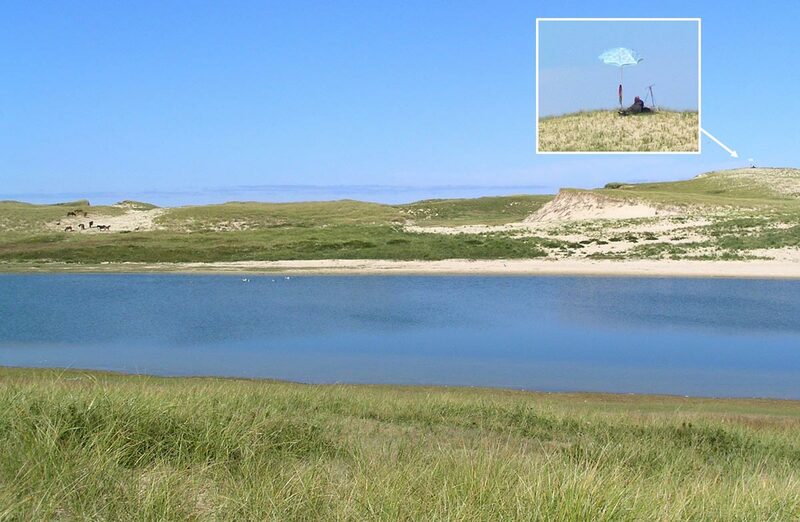 With an umbrella set up to shade his easel, Roger paints a West Light landscape, a view from the west end of Mummichog Pond. In the distance, behind a ridge of dunes, are some of the buildings at the meteorological station (as it was in 2005). 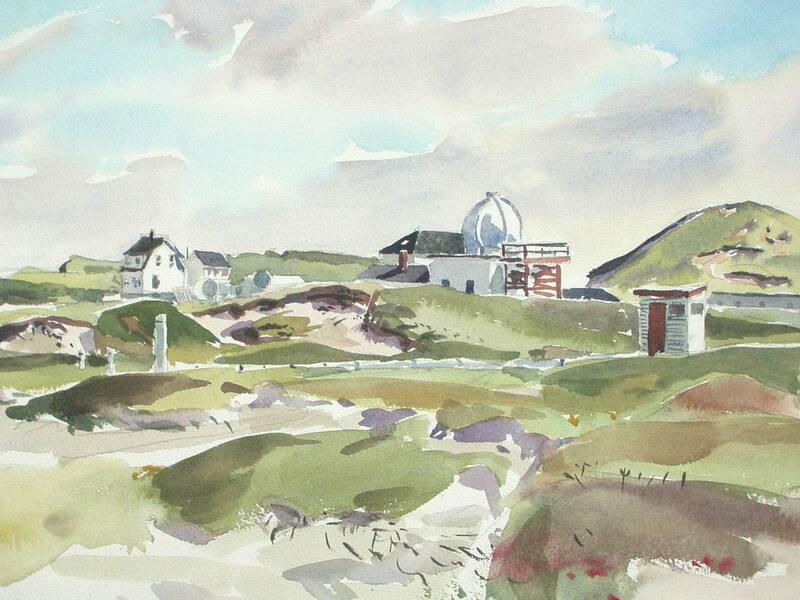 Roger also painted at the meteorological station where light and shadow on the mostly white buildings and the greens of early autumn gave shape to the landscape of the year-round human presence on Sable Island. “Weather Station” CAR©C Roger Savage, R.C.A. Looking towards the northeast, a view of the operations and accommodations buildings of the Meteorological Service of Canada in 2005. Also shown are two elements of the Magnetic Observatory (British Geological Survey) located at the station: the column enclosing the proton magnetometer and the unit housing the fluxgate theodolite. 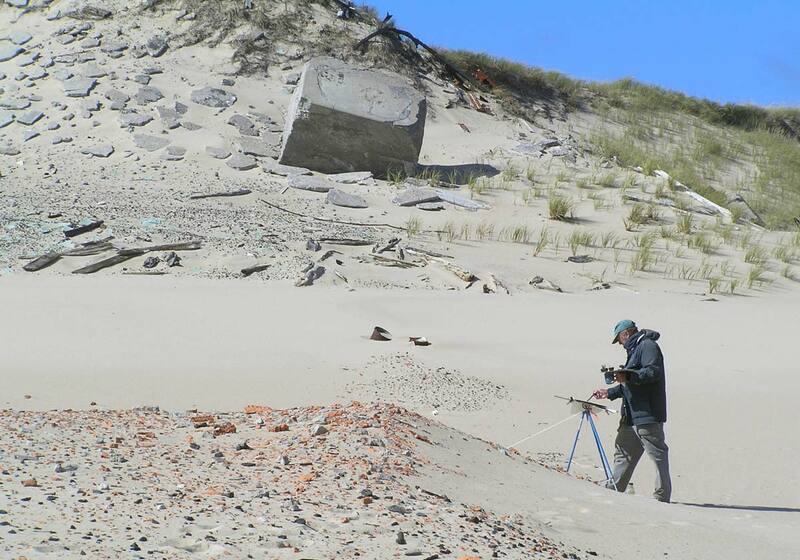 Roger Savage painting in the area of the long-ago abandoned light keeper’s house at East Light on Sable Island. Tumbled and scattered steel, brick, concrete, glass and wood debris, the ruins of an earlier East Light tower. 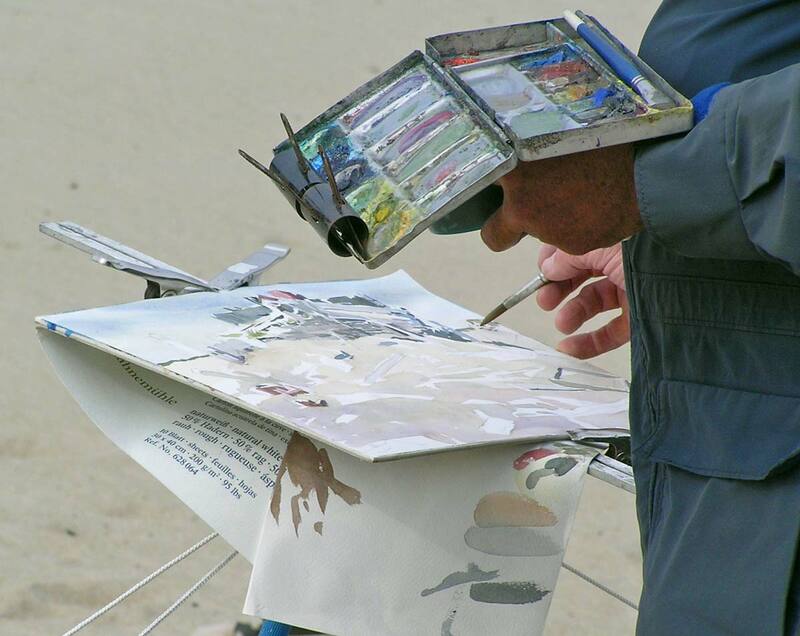 During several of his days on the island, Roger had to work at his easel in winds gusting to 25-30 knots. With his Polar experience, he was well-prepared to work in a windswept, isolated environment. 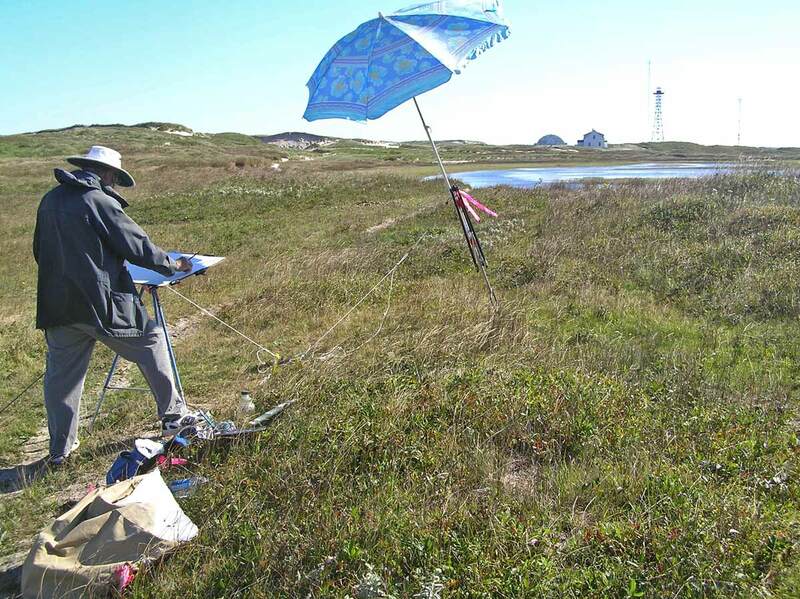 Roger brought some of his Arctic gear to Sable Island, including clamps, ropes and tent pegs to secure and steady his palette and easel. In some breezy locations, wind-blown sand grains adhered to the wet paint and paper and added a little fine texture to some of the artworks. 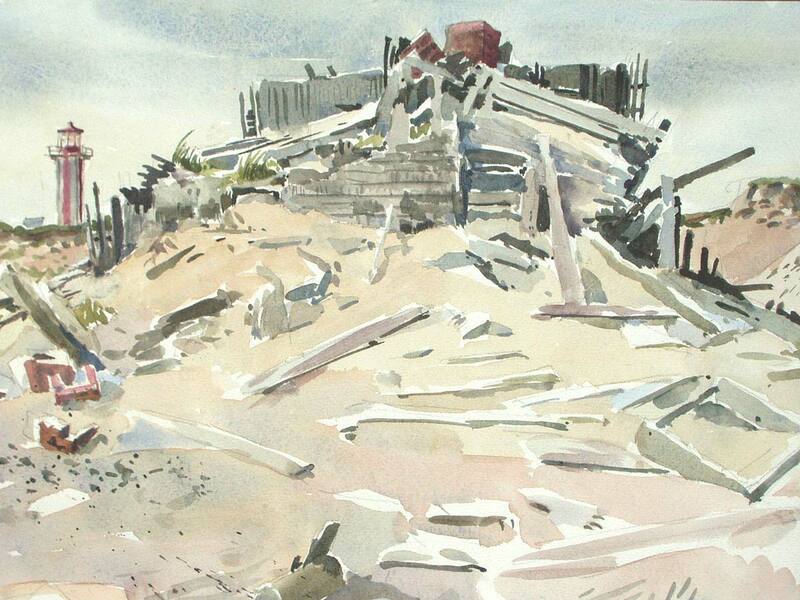 Here, Roger is working on the painting shown below, “Derelict House, East Light”. “Derelict House, East Light” CAR©C Roger Savage, R.C.A. 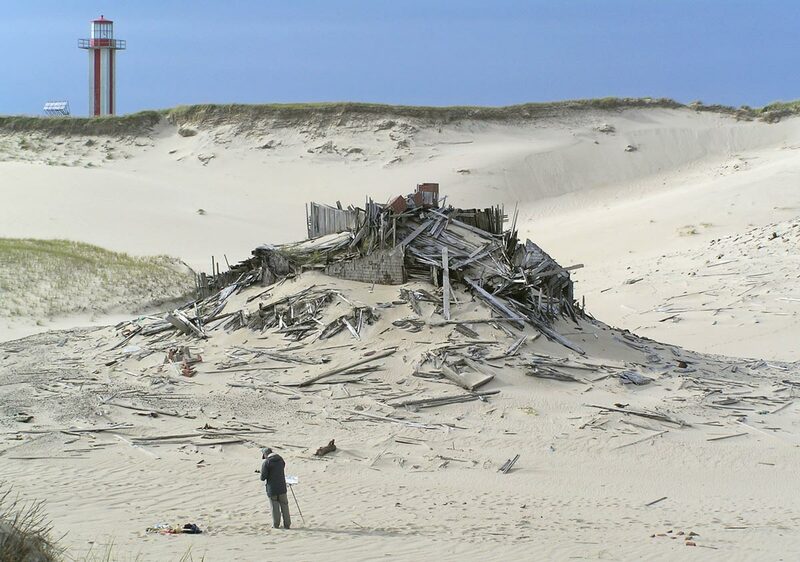 Ruins of the light keeper’s residence at East Light, with the light tower on the high dune in the background. “Ruins of Old East Light” CAR©C Roger Savage, R.C.A. 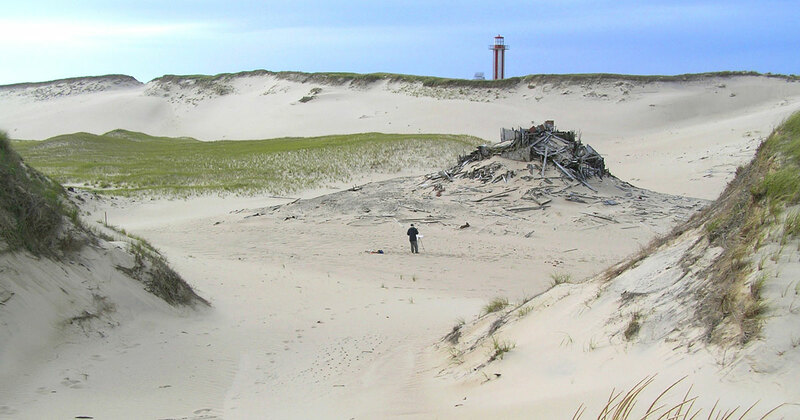 Ruins of an earlier East Light tower, with the most recent (and last) light tower on the high dune in the background. In 1991 Roger was a selected artist for the Polar Continental Shelf Project’s Arctic Awareness Program (Energy, Mines & Resources Canada). 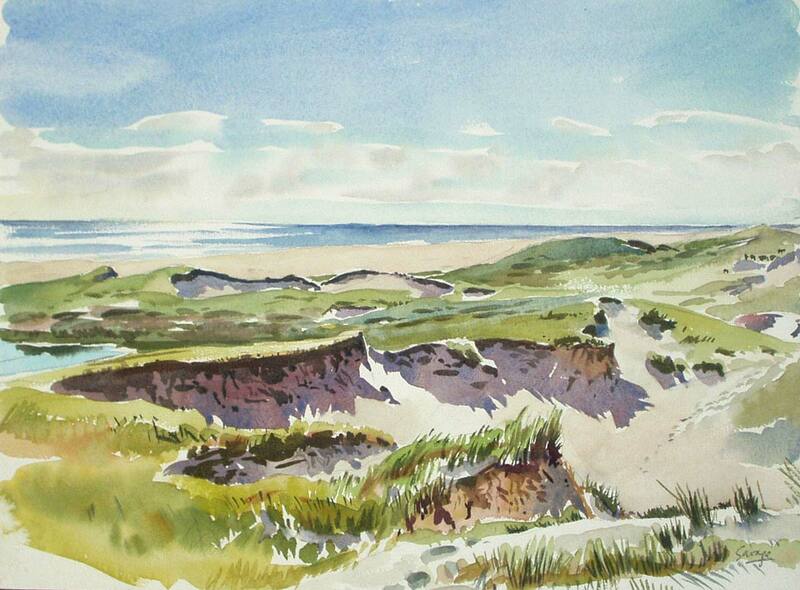 Supported by the Geological Survey of Canada’s summer field camps on Ellesmere and Devon Islands, he sketched and painted for two two-week periods in 1991 and 1992. For Roger Savage, the Arctic and Sable Island were in some ways similar—the sense of vast open space, and isolation. Being particularly inspired by the quality of light on big forms—the boulders of Cadden Bay or the dramatic sand dunes of Sable Island—he prefers painting into the light, with backlight defining the irregularity of topography. 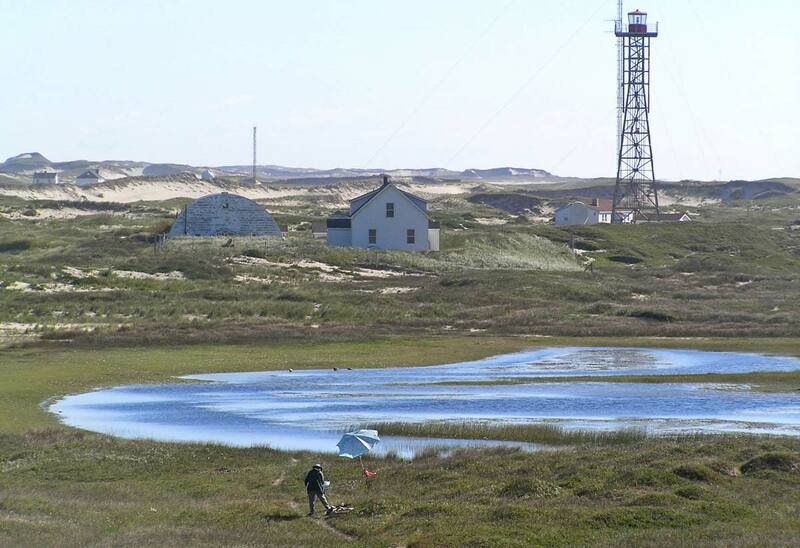 In the distance, on a hill overlooking Sable Island’s Gallinule Pond area, Roger set up his easel and umbrella, facing into the low-angle sun of early October. From this location he created the next painting,”Dunes and South Beach”. “Dunes and South Beach” CAR©C Roger Savage, R.C.A. Landscape in the Gallinule Pond area—the west end of the freshwater pond is visible to the left in the scene. 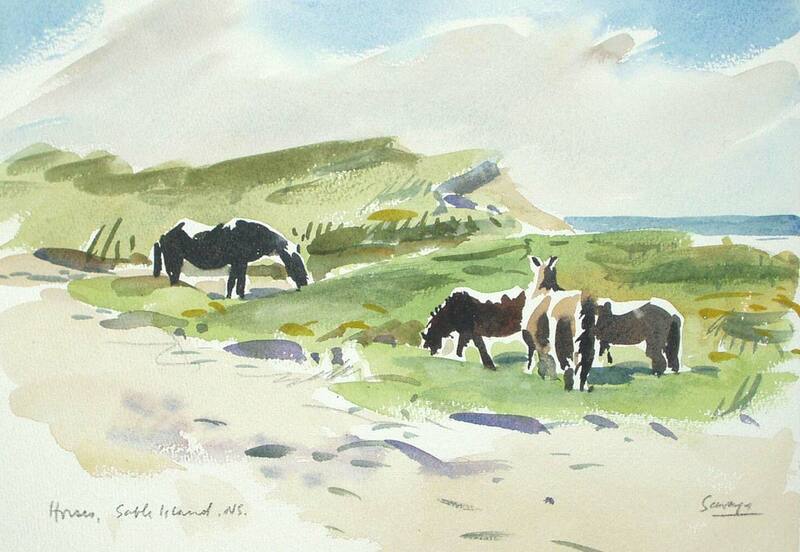 “Horses, Sable Island” CAR©C Roger Savage, R.C.A. A band of horses grazing in an area of marram grass and beach pea. “Horse, Sable Island” CAR©C Roger Savage, R.C.A. 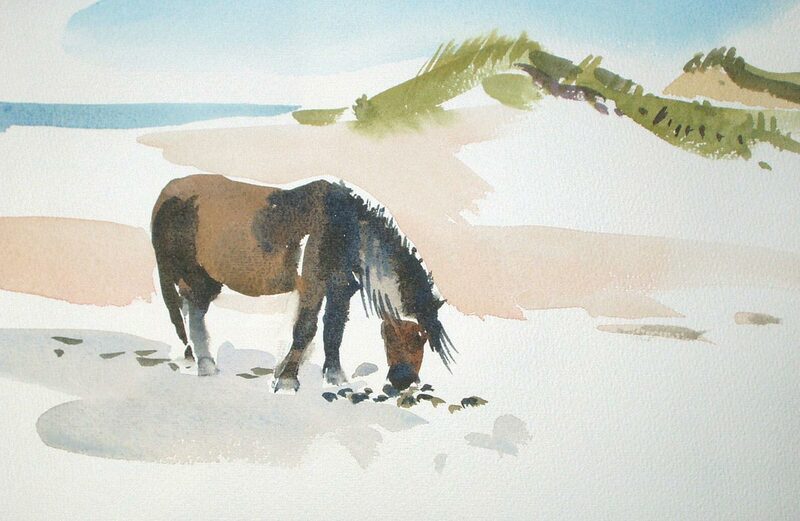 Sable Island horse—a solitary stallion—investigating a pile of horse dung on the beach. An earlier version of this article was published in the Green Horse Society’s website in October 2005.